Judging by the pre-entries, the third annual Chocolate Milk Mile should be the best one so far. A record 40-plus runners are expected to compete at this year's event, which will be held Sunday at Cranston West High School (RI). The event, which starts at 10 a.m., will feature open races and a seeded competition, which includes a long list of top-level former and current high school stars from the Ocean State and nearby New York and New Jersey. Former Barrington all-stater and Cornell freshman Mars Bishop will be back to defend his 2017 title when he cruised to a record 4:56.1 That record is certainly in jeopardy with the field that is expected to answer the gun. East Greenwich's Cebastian Gentil, the state's 800m champion who clocked a 1:49 leg for the Avengers' third-place 4x800m squad at the New Balance Nationals, has committed to this year's race. Also competing will be Gentil's teammate and recent Gatorade Athlete of the Year, Jeffrey Pedersen. Pedersen captured the state cross-country title in the fall and won the 1,500m at the State Meet this past June. UMass-Lowell freshman Ben Drezek, who starred at Cumberland High, is also entered. Drezek recently finished third at the Arnold Mills 4-Mile Road Race and clocked 9:04 for the 3K steeplechase this year for the RiverHawks. 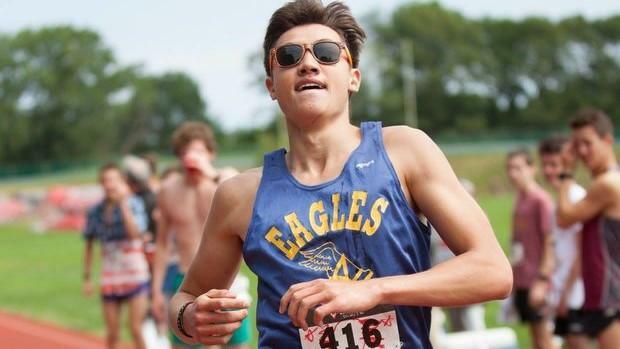 Other local standouts include Bishop Hendricken's Jack McMahon (seventh in the 5K at New Balance Nationals), Classical's Conor Murphy (1:54 best for 800m), Hendricken's Sean Meehan (state 3K winner), Westerly's Randi Burr (state girls' 3K champion) and La Salle's Joseph dos Reis (state 1500m titlist). Among some of the out-of-state notables are Sean Dolan of Hopewell Valley (NJ) and Burnt Hills (NY) teammates Nick Hunziker and Evan Brennan. Dolan, a 1:49 800m runner, captured the mile at the New Balance Nationals. Hunziker is a 4:14 miler and Weibaker is his state's 3,200m victor with a best of 8:59.46 from the Glenn B. Loucks Games. What exactly is the Chocolate Milk Mile? In this truly unique and challenging event, participants begin the one-mile race by chugging down a 16 oz. cup of chocolate milk. Each subsequent lap after that initial drink, participants again must chug down another cup of milk for a total of four (or a half gallon) during the race. Wright's Dairy Farm in North Smithfield has donated the milk for this year's event. The entry fee is $7, with most of the proceeds going to the Ronald McDonald House. There's plenty of time to enter. Just click on the link below.